KARACHI (92 News) – The Muttahida Qaumi Movement (MQM) has submitted petitions to the British High Commission and US Consulate, challenging moral position of PTI chairman of Imran Khan. 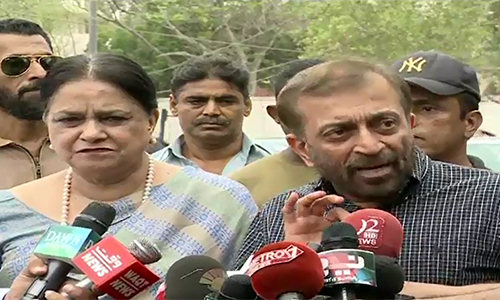 MQM deputy convener Farooq Sattar and Senator Nasreen Jalil, in the petition, stated that there are cases against Imran Khan with regard to parentage in a US court and he was summoned for tests, but he did not appear in court. They said that Imran Khan and Kh Asif also made statements against the Army and no action has been taken against them. Meanwhile, the MQM submitted a condemnation resolution against PTI chairman Imran Khan in the Sindh Assembly. Muhammad Hussain and Amir Moeen, in the resolution, contended that the language used by Imran Khan against the Army is condemnable. Talking to the media, Muhammad Hussain said that Imran Khan does not come up to Article 62 & 63 of the Constitution and his assembly membership should be ended.